Back from an Alaska cruise. Can’t wait to start to scrapbook the trip. Keep your eyes out as I will post the pages. I’m lucky enough to have booth my Brother, sister, sister-in-law & brother-in-law pictures. I take pictures with scrapbooking in mind & my sister with art in mind. My brother –in-law is great on face shots. My sister-in-law is great at the improv shot. My brother caught nature like the rest of us didn’t so I just can’t wait to scrapbook these pages. In the mean time they had a card making class on the cruise one day. Of course I had to go. Here is one of the cards we made. My favorite one. It came in a kit. So the Thank You is a sticker. It placed on a die cut & raised with pop dots. I took two pink jewels and attached them to the bottom left of the card. 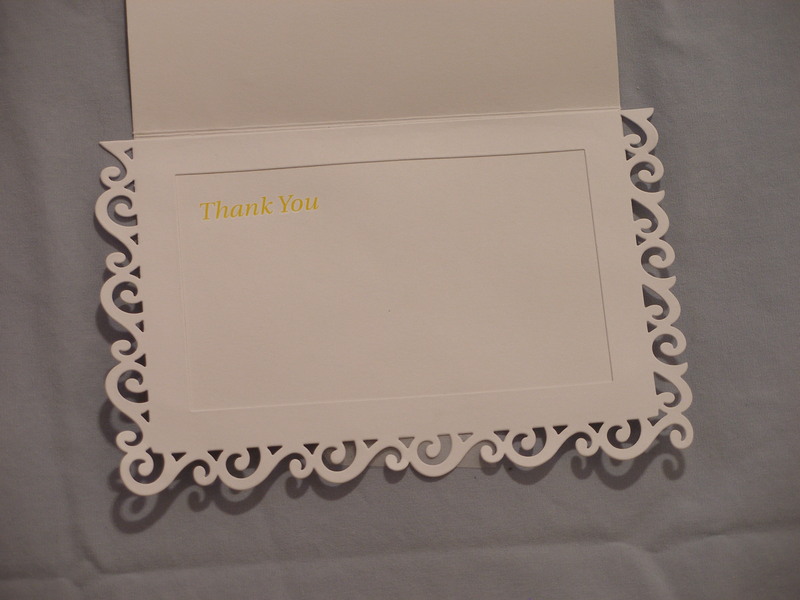 Inside I used a rub on to attach the thank you in yellow. Then the kewl part. It looks like they took a frame, cut off one side & then I attached it to the card making a frame on the inside & a decorative outside to the card.